Season High 44 Shots and Standup Defense Leads Amerks to Win · Let's Go Amerks! The way the game started out on Wednesday night against the Syracuse Crunch the game could have gone completely in favor of the Crunch or it could’ve been one of the fastest games of all time. Once the puck dropped around 7:05pm the first whistle wasn’t until five minutes and 13 seconds into the game. 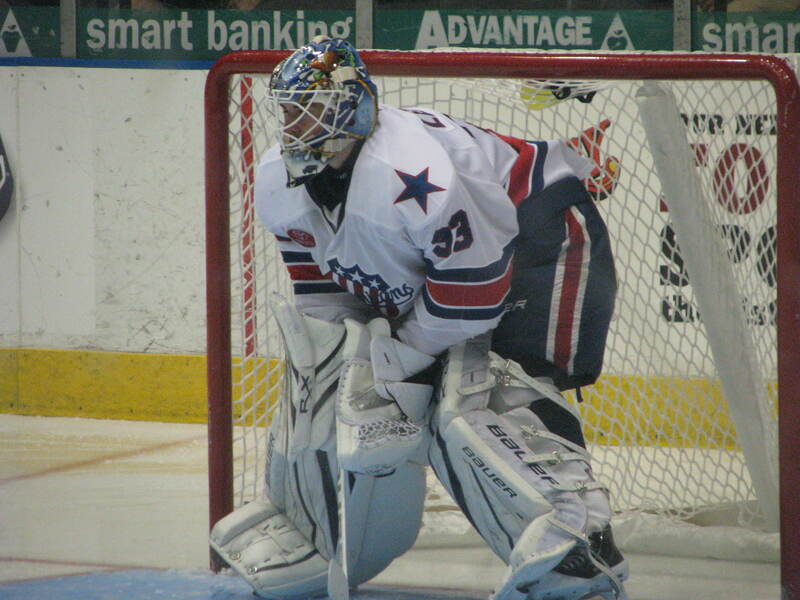 During that period the Crunch put most of the pressure on the Amerks but by the time the game was over the Amerks had won the game by the final score of 3-2 for their fourth win in a row. There were a lot of great plays and players on the ice but three that stuck out were all defensemen. The three defensemen were Joe Finley, Shaone Morrisonn and TJ Brennan. That’s not meant to take away from anyone else but those three made big differences in the game. 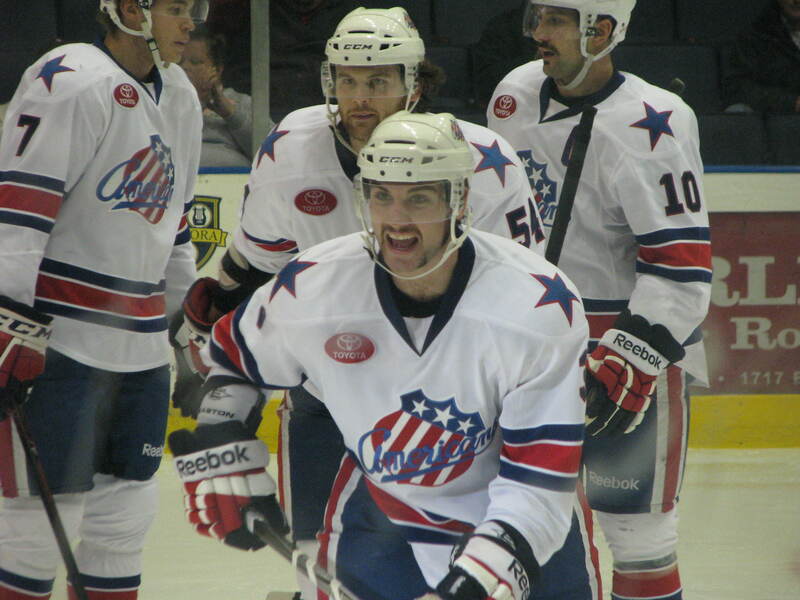 Finley and Morrisonn have become the top two defensemen for the Amerks and play the position very well. They aren’t allowing quality shots on the net by forcing the plays along the outside and they’re also showing they can jump into a rush when needed. Shortly after the game started Patrick Maroon of the Crunch was called for boarding and in the scrum immediately after along the boards Finley used one arm and sent Maroon backwards and onto the ice. That’s the other thing that’s great to see, a defenseman that will use his size and show the opposing team that they’re not going to be pushed around. The Crunch got on the scoreboard at 3:10 of the second period with a great cross ice pass from Bryan Rodney to John Mitchell who had no problem putting it into the net with a one timer. The Crunch had just entered the Amerks zone and the Amerks were out of position so they had no problems scoring. TJ Brennan followed right up just about two minutes later with a rifle of a shot from the top of the face off circle beating Crunch goaltender Iiro Tarkki. From my seat I was practically behind Brennan and he picked the opening and buried it perfectly. Up through the second period the game was back and forth with the Amerks getting many more chances than the Crunch but the Crunch seemed to spend more time inside the Amerks zone. This is where the defense did their jobs well which allowed the Amerks offense to get down the ice and continue putting shots on net. It only took 29 seconds into the third period for the Amerks to score a power play goal (remember when it seemed like that would never happen?). TJ Brennan received a pass from Zack Kassian through the middle of the ice and passed it to Colin Stuart who scored. The Crunch tied the game at two when Peter Holland scored a power play goal at 3:39. Mathieu Carle skated with the puck around Colin Stuart and passed the puck to Holland who was untouched and caught Leggio not back into position. Marcus Foligno scored the game winning goal on the power play at 13:50 of the third period. Mark Voakes had the puck to the side of the Crunch net and centered the puck right to Foligno who was in the slot to beat Tarkki who wasn’t centered for the shot. How great was it to see the Amerks finally play a game against the Crunch and hit them more than they hit us? There’s obvious changes in the lineups but it’s great to see. Maxime Legault plastered the same Crunch player against the boards twice within a short time frame of the first period. The Amerks put a season high 44 shots on net against the Crunch and only allowed 24. The Amerks only allowed three shots in the first period and four in the third before the Crunch tried to turn it up in the third period for the remaining seven shots. The two goals scored against David Leggio had more to do with the Crunch players getting open for great shots and not Leggio playing poorly. Not sure many goalies would’ve had a real chance on those except for the occasional miracle save. Joe Finely was given a 10 minute misconduct along with Mat Clark of the Crunch. Why? Good question. After a play there was a mixup near the Amerks bench and the linesmen got between the two of them. There were no punches thrown. A few shoves and a bunch of words but that’s about it. Only thing I can see is that they didn’t separate when the ref told them too and the ref was also preventing a fight from happening before the game was over. One of those, “What has happened to hockey?” moments. The announced crowd was 3,141 which was pretty good for an early season Wednesday night game. Those who were there were into the game and cheering on the team, it wasn’t like being in a morgue we’ve seen over the past four to five seasons. Since people that aren’t at the game seem to ask often here’s the line combinations for most of the game. MacKenzie was playing defense and on the wing at times during the game. 1st Period- No Scoring.Penalties-Maroon Syr (boarding), 5:45; Voakes Rch (interference), 18:26. 2nd Period-1, Syracuse, Mitchell 2 (Rodney, Kennedy), 3:10. 2, Rochester, Brennan 2 5:30. Penalties-Holland Syr (hooking), 3:20; Mitchell Syr (hooking), 13:24; Clark Syr (hooking), 19:14. 3rd Period-3, Rochester, Stuart 6 (Brennan, Kassian), 0:29 (PP). 4, Syracuse, Holland 3 (Carle, Sexton), 3:39 (PP). 5, Rochester, Foligno 6 (Voakes, Crawford), 13:50 (PP). Penalties-Szczechura Rch (delay of game), 2:31; McNabb Rch (hooking), 3:39; Sexton Syr (tripping), 11:57; Clark Syr (misconduct), 16:25; Finley Rch (misconduct), 16:25. Shots on Goal-Syracuse 3-7-14-24. Rochester 14-17-13-44. Power Play Opportunities-Syracuse 1 / 3; Rochester 2 / 5. Goalies-Syracuse, Tarkki 3-4-1 (44 shots-41 saves). Rochester, Leggio 5-3-0 (24 shots-22 saves). Linesmen-Tim Kotyra (53), Derek Sylvester (76).